You can restrict the distribution of a report (.fex), through scheduling, to the Report Library only. This applies to all reports, including those that may contain sensitive or private data, as well as other items for which you may want to limit distribution. Restricting the distribution of reports to the Report Library provides you with secure access to distributed report output stored in the Repository. For reports that contain sensitive data, this eliminates the possibility of using ReportCaster to schedule and distribute the information through email or any of the other ReportCaster distribution methods. In order to use this functionality, you must restrict the distribution of the report to the Library only using the Restrict Schedule to Library Only option on the Properties dialog box for the selected report, as shown in the following image. Note: You access the Properties dialog box by right-clicking a report (.fex) in the Resources tree. Then, select Properties. After setting the restriction, you can schedule your report using the Basic or Advanced Scheduling tool. Distribution will be limited to the Report Library only, as shown in the following image. You can create and schedule a report (.fex) to run using the Basic or Advanced Scheduling tools. The Distribution server continually evaluates and enforces the distribution restriction to the library (for those reports that are restricted) by not distributing the report. The Distribution server performs this validation every time a schedule is run. Create and save a report. 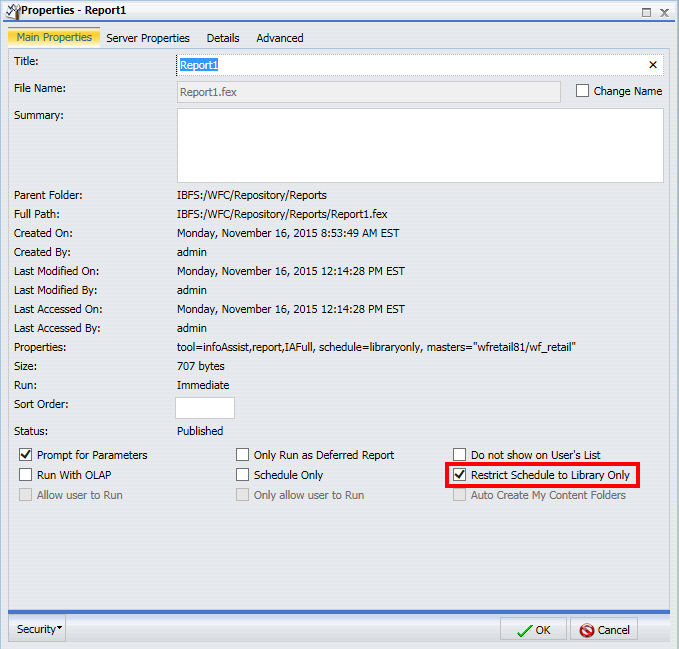 From the Resources tree, right-click the report and click Properties. On the Main Properties tab, select the Restrict Schedule to Library Only check box. From the Resources tree, right-click the report and click Schedule. Note: With the restriction set, your distribution is limited to the Report Library. Save and run the schedule. Optionally, review the log information in the Job Logs section of the ReportCaster Console, as described in Log Information. For more information, see Using the Report Library Distribution Option in the Basic Scheduling Tool. You can launch the Advanced Scheduling tool by right-clicking on a folder in the Resource tree, selecting New, and then Schedule. The Advanced Scheduling tool can also be launched by editing an existing schedule. 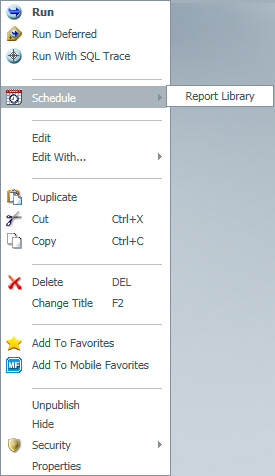 From the Resources tree, right-click the folder in which the report resides, click New, and then click Schedule. Add a task for a WebFOCUS report, selecting the report with the restrictions. 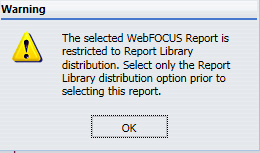 Note: When you select a WebFOCUS report to include in the schedule that has the Restrict Schedule to Library Only restriction set, you can only distribute to the Report Library. An error message will display if you attempt to select a different distribution method. For more information, see Restricted Schedule Warning Messages. For more information, see Using the Report Library Distribution Option in the Advanced Scheduling Tool. If you have a report for which the properties indicate that the schedule should be restricted to Report Library distribution, you may encounter the following warning messages. If you try to select a different distribution method within an existing schedule, an error displays. For schedules that have multiple distribution methods specified, an error displays if a report that is restricted to Report Library distribution is added to the schedule, as shown in the following image. After a schedule has run, you can access the log information from the Job Logs section of the ReportCaster Console, as shown in the following image. If you create a schedule that distributes using a method other than Report Library and you subsequently change the properties of a report (.fex) in that schedule to restrict the schedule to Report Library distribution, the following job log displays with a Task error that the task was not processed because it is restricted to Library distribution.